Watching Paint Dry questions pervasive contemporary attitudes and expectations in relation to technology. We live in a world where a video that features an outdated and outmoded screensaver generates some 8,330 results on YouTube and receives over 1 million views combined. But the idea of actually watching paint dry, once considered a forum for contemplation and letting the imagination wander, now has such negative connotations that it is akin to a kind of punishment and an absurd “waste of time.” Watching Paint Dry comes out of this kind of mindset and attempts to highlight this irony. 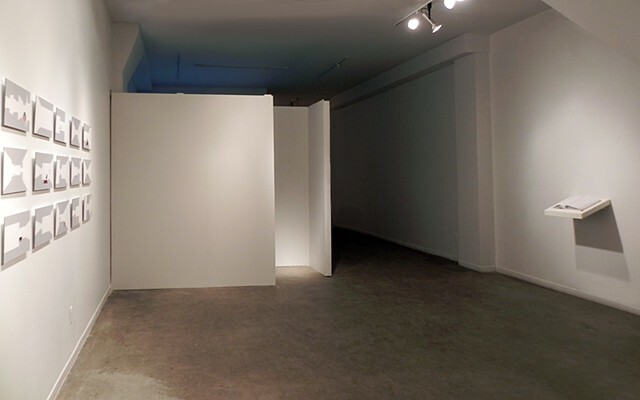 This exhibition positions two forms of walls in relation to each other: an analogue wall, synonymous with the expression “watching paint dry”, and a virtual or digital wall, in its most basic form as the Microsoft Windows 95/98 Maze Screensaver. These two kinds of walls are used as markers of two different sites, each imbued and ingrained with different cultural habits and attitudes. Watching Paint Dry highlights the shifting expectations, experiences and abilities in relation to analogue and digital sites and the ways in which certain sites are privileged or negated in terms of time, entertainment, and contemplation, as well as the value judgments inherent in this negotiation. Ultimately the works in the exhibition explore the ways in which we understand, conceptualize and make sense of our everyday life through a questioning of analogue and digital sites and the ways in which these sites are received in contemporary society. Watching Paint Dry as installed in La Centrale Galerie Powerhouse, Montréal, Québec (January 29 – February 5, 2014).